What’s with all those duels? The Russian literature of the 19th century is full of duels. 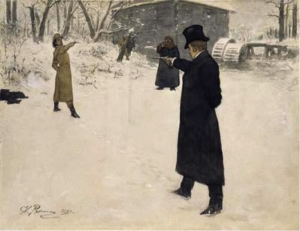 Duels figured prominently as subjects in important works by all the major writers of the period: Pushkin, Lermontov, Tolstoy, Dostoyevsky, Turgenev, and Chekhov. Duels also killed Pushkin at 37 and Lermontov (“the only poet who might have compensated the Russian literature for Pushkin’s loss”) at 26! And yet, throughout this period duels were strictly prohibited and (surviving) participants punished severely (including exile and demotion in rank). The popularity of duels is a puzzle. For one thing, Russia didn’t have the medieval tradition of knightly jousts, which possibly accounted for the existence of duels in Western Europe. And just as these were replaced by non-lethal equestrian sports in England and France, in 17th century, lethal duels become pervasive in Russia in 18th and 19th centuries. Why? Before we try to answer this question, let’s note that there is another country that had quite a few duels, especially in early 19thcentury, without any traditions of jousting. Namely, the US. After all, we had Burr killing Hamilton, Jackson being involved in several, the Clay/Randolph duel, and even Lincoln coming close to being a party to one. That was especially true in countries like the US or Russia, which were very large and where populations moved around. One would extend credit to “honorable” people only because one knew that if they didn’t pay it back, the knowledge of the unpaid debt would become intolerable and would require the debtor to put his life on the line. So in a way, let’s all be grateful for the FICO scores.